Upon meeting Shannon Kraemer, the CSLC’s outstanding foreign language student for October 2014, I was immediately struck by her infectious and unique spirit. A junior double majoring in Economics and Program of Liberal Studies (PLS) and minoring in Korean, Kraemer has a gusto for Korean studies and this is evident to the Department of Korean’s Dr. Yeonhee Yoon, who nominated Kraemer for the Spotlight. “Shannon has an enormous passion for learning the Korean language and culture," said Yoon. 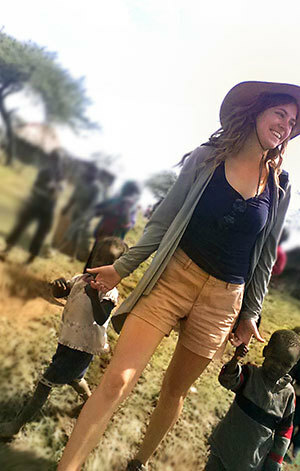 Kraemer has an audacious and whopping zest for life in general, and a sincere passion for humanitarian causes and service. Indeed, Kraemer, a native of Evanston, IL, is “currently writing the constitution” for a club she’s forming at Notre Dame: the Notre Dame Club for Liberty in North Korea. This isn’t the first club, however, that she’s created in her scholastic career. Kraemer has a record of forming clubs and organizing fundraisers to support international causes. And that record is impressive. In the last handful of years Kraemer, by opportunities taken or created, has had more life-changing international experiences than most people in their lifetime. These experiences have given her some ideas of where she’d like to be in five years, and they include international destinations with service in mind. It was evident throughout the interview that her insatiable curiosity for international cultures, her humanitarian sensibilities, and her authenticity and energy make her future as bright and boundless as she makes it. Below, the CSLC presents Shannon Kraemer. If you had a one-year, all expenses paid trip, where would you be, who would surround you, what would you be doing? I would return to Haiti and work again with Mother Teresa’s Missionaries of Charity. I was there for just one week and I would love to go back and do as much as I can to further their mission to assist the poorest of the poor. What is your 3 – 5 Year Trajectory? Which of these tugs at you the most? I’d go with Catholic Relief Services, preferably in North Korea or Latin America so that I can continue to develop my languages while serving others. Planning and researching my senior thesis. I will either write about the developing underground economies of the young Jangmadang generation in North Korea or the miraculous leap of the South Korean economy between the 1950s and the present. When will this club be official? When did you get this idea and why? I’m meeting with the SAO (Student Association Organization) and currently writing the constitution for it. One part would have a rescue team (i.e., fundraising team with Liberty in North Korea–- LiNK). We’re having events next year and plan to bring a North Korean refugee to speak who I heard last year and was very moved. It made me much aware of the human rights injustices being suffered in North Korea. What language(s) do you study/know (since elementary and on)? When, Where, Why? Although recently I dove head first into studying Korean, Spanish is the language that I had been learning nonstop since Kindergarten until my Sophomore year at ND. Due to my early start, continuing Spanish had been an easy choice because it was familiar to me. 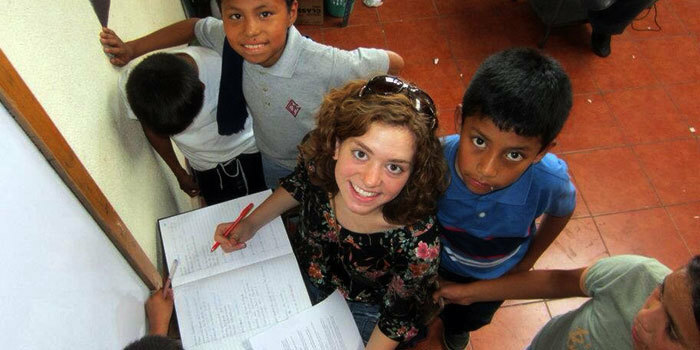 However, my true desire to learn Spanish was only spiked in 2010 when I went on my first mission trip to Mexico and befriended the kids there… I actually ended up writing my college application on the experience because I was so shocked at how I was able to form friendships with so little speaking proficiency. The second time that I traveled to Latin America was 2011, when I studied Spanish intensively for five weeks in Antigua, Guatemala. This time, I stayed with a host family and really picked up a lot more of the language. I believe that Spanish is absolutely crucial for US citizens to learn within the context of our Hispanic population’s exponential growth seen since 2000 (nearly a 50% increase). After taking one Spanish course (20202) my first semester to complete my language course requirement at ND, I figured that I would no longer have room in my schedule to pursue learning the language any more. However, I had only been away one semester from the CSLC, which I had loved using for Spanish tutoring, before I dashed back sophomore year and begged my advisors to allow me to add Korean into my schedule. I had picked up words of it from my Korean international friends at Regina Dominican High School in Wilmette, IL and wanted to try it out for one semester, max. People often quizzically ask me why I chose to study Korean, but I don’t mind because I love to answer the question. For one, most people aren’t aware that there are more people speaking Korean in the world than there are people speaking French. More importantly, I love the Korean people! I really appreciate the culture of respect and kindness that I experienced while in South Korea. I have found that language learning at Notre Dame is a true delight. Language courses tend to be my smallest classes (a lot to say coming from somebody majoring in seminar-based Program of Liberal Studies), and I always end up forming close relationships with the students and teachers in the open space. Both the Spanish and the Korean Departments have been phenomenal with offering extracurricular events where we can learn about culture and practice our casual speaking. I especially love the most recent 추석 thanksgiving festival and the Korean movie nights. Right now, it’s my current Korean class, Year 2 Level 1. Professor Yoon is a phenomenally motivational instructor, and within her class I can see myself getting better at speaking and writing day-by-day! We laugh a lot while we learn, which is very healthy and conducive to learning. Korean with Professor Yoon has never been a chore for me in the least, and I often find even the studying to be fun! And I’m not the kind of student to usually proclaim my joy for homework, but I know that each of her assignments are so well focused that I get a lot of language progress from every assignment I do, which is really encouraging to me. I have used Korean and Spanish to ask for directions, buy tickets, order meals, ask where to find the bathroom, share stories, and make new friends. Intend to make a fool of yourself! Throw the fear of embarrassing yourself out the window because there cannot be progression in speaking unless students are willing to make mistakes when they are learning. Also, MUSIC! I learn best by replaying and studying songs in Korean and Spanish until I can understand the lyrics and even sing along. I’ve been on mission trips abroad but my first study abroad experience was studying Spanish intensively for five weeks in Antigua, Guatemala where I stayed with a host family and really picked up a lot more of the language. I also studied in Seoul, Korea, this summer at Sogang University through a generous Summer Language Abroad Grant from the CSLC. I started a mission club in high school, and both of the international missions we did had an enormous impact on how I see the world. 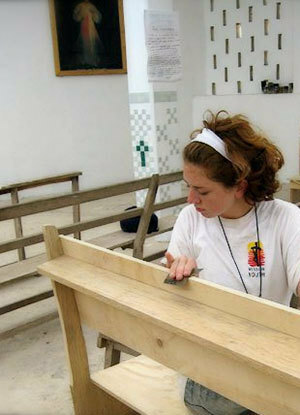 Firstly, at a Mayan village on the Yucatan peninsula We had spent the week building benches and painting for the new church at the town of Nuevo Durango, Mexico. I had to leave a day earlier than the rest of group in order to make it home in time for my older sister’s college graduation, (the Spanish major), and was waiting alone for the bus a bit before five in the morning on my last day. Although at this point in high school I could hardly make sentences in Spanish, I had formed close connections with the kind people and children from the village across the language barrier. One girl in particular, however, touched me especially deeply with her friendship that morning when she came and sat with me for my bus – giving me no forewarning that she had intended to get up early and wish me off. This gesture from a thirteen year-old really taught me how similar we all are in our hearts, and that because of that sometimes we don’t even need to say anything or to have similar backgrounds with people to make a friend. Secondly, in Port au Prince, Haiti. The day after I graduated from high school we flew to Haiti to care for the malnourished babies, and we even made visits to the “houses for the terminally ill”. One day we cleaned and dressed wounds at a street clinic, and even when Iodine was put onto open wounds the patients would not flinch. The lack of medical attention and resources was the polar opposite of my experience from working at Evanston hospital for two summers. This experience completely shifted my perspective on the human tolerance for pain, and gave me a huge appreciation for my access to basic health care in the United States. It also sparked my interest to potentially work in the healthcare field. One of my great mentors has been Professor Rachel Parroquin from my 20202 Spanish course. She would always reread my Spanish essays—-no matter how many times I asked her to correct them. To this day, I really enjoy the quick visits to her office when I can chat with her in Spanish and learn about all the exciting ways she integrates the Spanish Department with Notre Dame’s CSC (Center for Social Concerns). As I have already mentioned, Professor Yoon has been a phenomenal mentor and professor to me for the past three consecutive semesters. I’ve never met a professor who’s as invested in the well-being of her students. Also I think it’s so exciting that the Korean Program is growing this year. Professor Hana Kang and Boeun Kim, our Korean Fulbright, have added so much more dimension. They’ve added such community feel, culturally and academically. Center for the Homeless. I have volunteered at the center with Professor Power from the PLS department, which involved childcare work and assisting teach a Great Books Seminar course. • Celebration Choir. Last year we traveled to sing at Westville Correctional Facility with Father David Link and this year one of our trips will be to sing at a local nursing home. Have you received any grants at Notre Dame? Summer Language Abroad (SLA) Grant to Sogang University. I chose Sogang because of its emphasis on speaking and listening. Every day, they compelled us to answer questions and speak entirely in Korean. It really accelerated my comprehension. Tutoring Tutoring Tutoring!!! I love getting the chance to chat with Boeun Kim for an hour and a half a week. Also, my SLA Grant helped me enormously improve my Korean. Discuss your experience with volunteerism or civic engagement. I founded the Regina Dominican High School Mission Club. It’s a Catholic missionary club that fundraises and brings high school students to do volunteer work abroad during the summers through the organization Mission Youth and Chicago’s Regnum Christi. The first year I started the club only five of us went (Mexico), then the day after our graduation day fifteen girls in our grade came with us to Haiti to work with the Missionaries of Charity. Currently, the club has grown to sending more than forty girls abroad for service each summer to two separate locations. Within Chicago, we started a project to bring brown bag lunches to the downtown homeless on as many Saturday mornings as possible. At Notre Dame, the Center for the Homeless, Liberty for North Korea. I am a huge theatre nerd, and did plays/improve troupes all through high school. I have training as a Dominican preacher. I live in Welsh Family Hall, and my current favorite movie is “How to Train Your Dragon 2”. I’m honing my bird whistling too. Finally, I’m hoping to try out for ND’s club lacrosse team in the spring! “Shannon now has just begun her study of Second Year Korean I, and is determined to pursue a Korean minor. She has an enormous passion for learning the Korean language and culture. This passion is evident through her consistent attendance and support of all of the Korean Program events. Less than a year ago, Shannon approached me as a sophomore to undertake the study of Korean, having no prior knowledge of the language at all. Now, I am proud to see how well she can communicate in Korean, one of the most difficult languages for English speakers to learn. I am extremely impressed with how great of a leap Shannon made during her study at Sogang University with the SLA Grant from the CSLC. On many occasions, Shannon has incorporated bits of her Summer experience into the classroom discussion, inspiring other students to pursue their studies with renewed vigor. She is an extremely dedicated student who visibly takes joy in learning as much Korean as she possibly can. In addition, her concern for the human rights of North Koreans led her to organize the Link (Liberty in North Korea) in the near future." Originally published by Matt Getze at cslc.nd.edu on October 10, 2014.